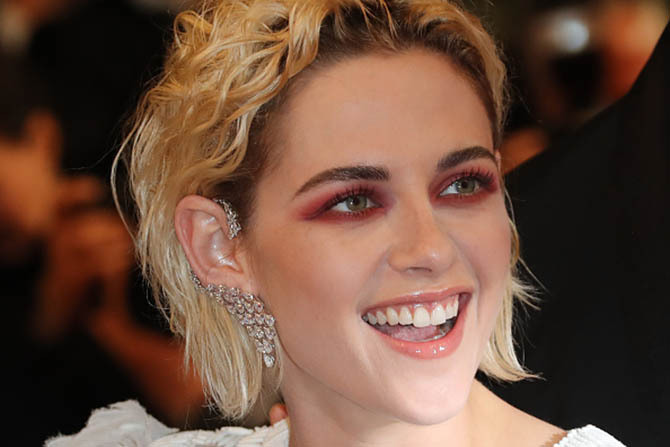 There is almost as much jewelry—maybe more—during the eleven days of the Cannes Film Festival as there is during the entire Awards Season in the first couple of months of the year. Clearly, the glamour of the South of France and the proximity to the couture center of Paris inspires megawatt looks. Chopard, of course, has also helped the cause by being a key sponsor of the event for 20 years. Oh, and there is a strictly black tie rule that means even the paparazzi have to be dressed in tuxedos and gowns. The abondance made the task of putting together a “Best of” list daunting. So, in honor of the 2017 Cannes Film Festival opening today, I have assembled highlights that have lingered in my mind from the last several years. If you are wondering about vintage jewelry glamour. The truth is, with the exception of Elizabeth Taylor and a few moments for Sophia Loren, jewels on the red carpet were scant until actresses started working directly with the big design houses. 2016 Kirsten Stewart in the Calypso ear cuff by Messika and Chanel dress at the premiere of her film Personal Shopper. 2015 Julianne Moore in Gemfields emerald and diamond earrings from Chopard’s Green Carpet Collection at the premiere of La Tete Haute. 2015 Jane Fonda in a Schiaparelli gown and Cartier’s Reine Makéda Necklace of diamonds and rubies including a 15.29-carat center stone from Mozambique at the premiere of her film Youth. 2015 Sienna Miller in a Valentino gown with a cape and a Bulgari diamond choker that resembles a lace collar at the premiere of the film Carol. 2014 Blake Lively in a Gucci gown and custom made flame diamond pendant earrings by Lorraine Schwartz at the premiere of Grace of Monaco. 2010 Cate Blanchett in Givenchy gown and sapphire and diamond earrings and a Paraíba tourmaline ring by Chopard at the premiere of her film How to Train Your Dragon 2. 1997 Johnny Depp with Kate Moss in a Narciso Rodriguez sheath and her own antique earrings.